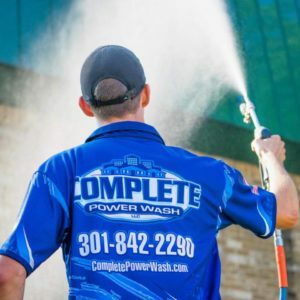 Complete Power Wash LLC is a Pressure Washing company that serves the greater Hagerstown, MD area, including parts of West Virginia (Martinsburg) and Pennsylvania (Waynesboro, Greencastle). The company began offering pressure washing services in 2007 when Tim, Sandy and Zach Fields of Clear Spring, Maryland realized there was a need for a professional exterior cleaning company in the area. The family-owned business specializes in the softwash technique, which combines low water pressure and environmentally-friendly detergents to ensure an effective, yet safe technique to cleaning all exterior surfaces. Tim’s background as a building contractor in the greater Hagerstown, MD area, coupled with Zach’s keen eye for detail and attention to customer satisfaction, means that Complete Power Wash clients will receive nothing less than the finest service available. Our team is among the best in the pressure washing business in the area. To read our expert advice, click on our blog. Among the residential pressure washing services offered by the Fields are siding cleaning, roof cleaning, deck and patio cleaning. Beyond this, they will entertain special washing projects, and are even trained in commercial and industrial power washing. They even clean church steeples. If you would like to see a gallery of our work, click here. In addition to their commitment, Tim and Zach are both very active in the community. Tim has two other companies in the area, Blue Box Rental and Sign2Day. Zach is the proud owner of an historic building in Clear Spring, from which he manages the Clear Spring Laundromat. Learn more about these other Fields family businesses! We have you covered for Websites, Signs, logos, printed design pieces, anything you need to market your business! Visit Sign2Day.com to learn more. Need a dumpster rental for your next big cleanup job? Visit us at Blue Box Rental.